Dorner Conveyors can be engineered to fit your specific need. One option to consider is a retractable tail, a feature where an end of the conveyor shortens or lengthens depending on where you want the product. In this application, the pneumatic retract allows the conveyor length to change depending on the product and the type of packaging. The length adjustment sends the product to one of two types of equipment: either single or bulk packaging. The customer also needed a conveyor that would fit into a sanitary environment. The retracting tail is engineered into an AquaPruf 7400, which is designed for high-pressure washdown and ease of sanitation. 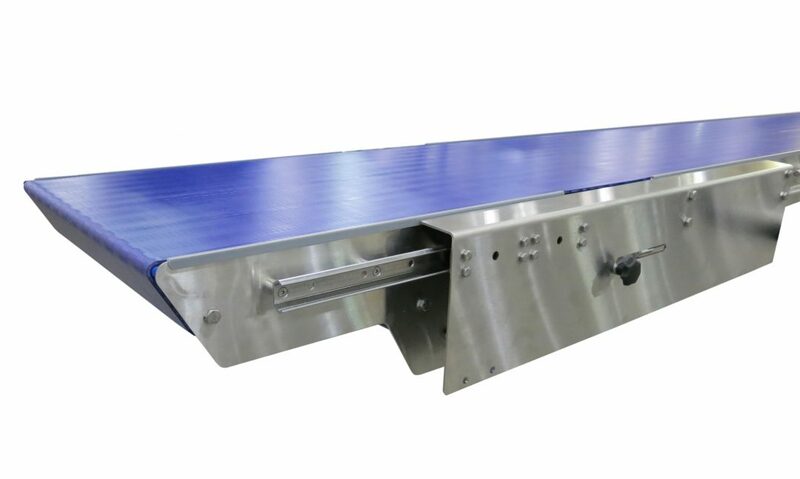 Features of this conveyor include belt lifters, minimal horizontal surfaces, and a retracting tail tensioner which allows for fast access to the frame for cleaning. Contact Us to learn about other ways that Dorner Conveyors can be engineered to fit your application.